Five candles, five platforms, five cups all add up to a dazzling display of style. This metal candle holder features a staggered design that will capture your interest. The slim design makes it the perfect addition to your dining table, mantel or sofa table. Item weight: 3.2 lbs. 13½" x 3 7/8" x 7" high. Iron and Glass. Candles not included. Perfect Ornament For Weddings, Anniversary and Birthdays Tabletop Decor. 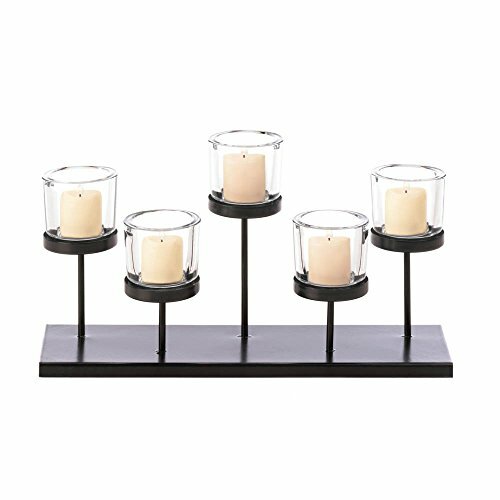 This Candle Holder Is Crafted From Iron and Glass, That Is Sure To Serve You With Long Lasting Durability. An Adorable Piece Of Art That Is So Perfect To be Given As Gift For Loved Ones. 100% MONEY BACK GUARANTEE: DecoDuke is a Customer-Centric Brand and Your Satisfaction is Our #1 Priority. If You Don't Love Our Candle Holders For Any Reason, You Will Receive a Full Refund or Free Replacement GUARANTEED!